So, if you wanted the only Android phone out there with a keyboard, but thought the $875 price was too expensive, the littler sibling, the Key 2 LE is now available. It'll come in a 32GB variety at the carriers ($0 on contracts), and a 64GB variety at a few online stores ($600CDN). 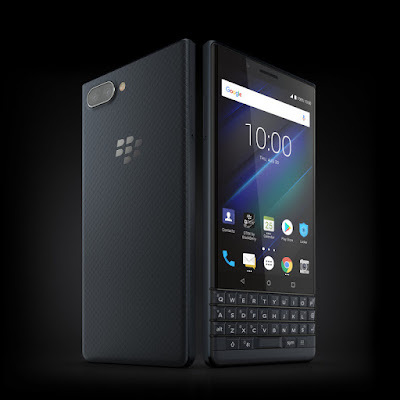 TORONTO, Oct. 4, 2018 /CNW/ -- TCL Communication, a leading global smartphone manufacturer and BlackBerry®- branded licensing partner, announced today that its newest BlackBerry smartphone – the BlackBerry KEY2 LE – is now available in Canada starting today. This new addition to the BlackBerry KEY series smartphone lineup maintains the BlackBerry KEY2 design evolution which includes minimized screen bezels and redesigned chassis for a more modern aesthetic, while bringing subtle new design refinements that make it slimmer and lighter. The recently introduced Speed Key allows for a more customized universal shortcut experience, and in addition to its Android™ operating system, it includes support for popular features like the Google™ Assistant, Google™ Lens and Google Pay™. "Today's smartphones try to offer a one size fits all solution, but that's no longer realistic when we have a global marketplace as diverse as we have today," said Alain Lejeune, Senior Vice President, TCL Communication & President, BlackBerry Mobile. "This is why we are focusing on making modern BlackBerry smartphones like KEY2 LE, to stand out and deliver a great experience for everyday communication, with access to all the features, connectivity and applications our customers expect." "The BlackBerry KEY2 LE brings a fresh new personality to TCL Communication's BlackBerry KEY2 portfolio that includes all the security features that make BlackBerry phones the world's most secure Android™ smartphones," said Alex Thurber, Senior Vice President and General Manager of Mobility Solutions at BlackBerry. "With this new addition to their product lineup, the KEY2 LE keeps the iconic BlackBerry styling while offering an accessible entry point for our fans around the world to enjoy a modern BlackBerry smartphone." PURPOSEFUL DESIGN FOR THE MODERN COMMUNICATORCapturing the balance between iconic BlackBerry design and modern elements, the BlackBerry KEY2 LE features a lightweight polycarbonate frame and a newly designed soft textured back that provides better in-hand grip to prevent drops and includes a Full-HD, 2.5D display. With similar BlackBerry KEY series dimensions, the BlackBerry KEY2 LE is both thinner and lighter, and boasts a redesigned keyboard with keys that are nearly 10 per cent larger than those featured on the BlackBerry KEYone. Designed for accuracy and precision, the physical keyboard includes the Speed Key that enables shortcut access to a number of functions on your device at any time, without having to return to the home screen or search in an app folder to access the apps, contacts and functions you use and communicate with most. The Speed Key is complimented by 52 customizable shortcuts, so you can program each key to instantly bring up the contacts and apps you use most. A dual rear camera (13MP+5MP) with great new capture experiences, including Portrait mode is also featured on the BlackBerry KEY2 LE. This is complemented by an 8MP front camera that comes with LCD flash and new capture modes like Wide Selfie (selfie panorama) and Face Beauty, which offers new selfie capture enhancements. You can also learn more about the world around you with Google Lens™ camera integration, which can help you quickly access more information on landmarks, buildings, books and more simply by pointing your camera at the object. ENHANCED PRIVACY YOU CONTROLNow you can take personal control of your smartphone privacy with features like Locker that allow you to manage what information is shared in the cloud, like your photos and documents. Locker provides a personal space on the device where you can store apps you want to keep private along with sensitive documents and photos. Firefox Focus™, the privacy browser by Mozilla®, is also included so you can avoid trackers and automatically delete your browsing session when the app is closed. The BlackBerry KEY2 LE also includes the refreshed DTEK™ by BlackBerry application that brings new scanning features for proactive security checks to easily identify and mitigate potential security risks, such as unwanted data access by a downloaded application on your smartphone. And a commitment to monthly Android™ security updates means you'll always be protected from the latest threats. PRODUCTIVITY YOU CAN ONLY FIND IN A BLACKBERRY SMARTPHONEWith the BlackBerry KEY2 LE, you have all the features you need to manage your work, travel, and personal life on the go. This includes support for dual personal accounts and business ready software that makes it easier to manage all aspects of your life. Dual account management is built in to enable you to separately manage both personal and professional social media profiles on apps like Facebook® and Instagram™, and on the dual SIM variant of the BlackBerry KEY2 LE, you can also have dual WhatsApp® and other accounts that require unique numbers. It also comes loaded with BlackBerry® Hub which brings all your messages into one consolidated place – including emails, texts and messages from almost any social media account, including WhatsApp®. POWER TO GET YOU THROUGH THE DAYDelivering the power and performance expected from a BlackBerry smartphone, the BlackBerry KEY2 LE comes with 4GB of memory and in both 32GB and 64GB storage variants – with both offering expandable storage MicroSD support. It is powered by a Qualcomm® Snapdragon™ processor and an efficient battery that offers up to 22 hours of mixed use to get you through the busiest of days and often into the next day. In addition, the BlackBerry KEY2 LE features Qualcomm Quick Charge® 3.0, enabling up to a 50 percent charge in about 36 minutes – enough power to get you through a normal work day. The BlackBerry KEY2 LE also comes with a Boost mode charging and contextual battery reminder which will learn from your daily charging habits and calendar appointments to recommend when to charge so you have the battery power you need when you need it most.